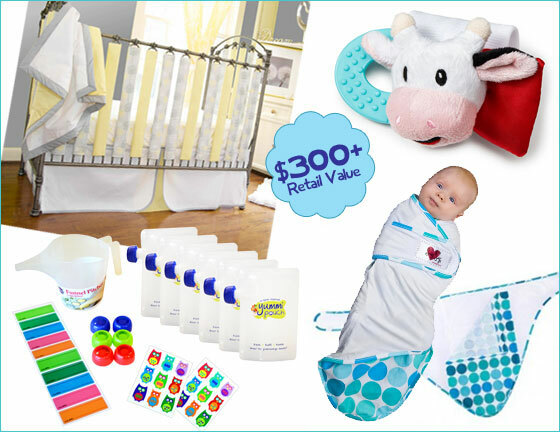 Here is your chance to win a great giveaway bundle of problem-solving products for your baby! These products are all life-hacks and aim to make life easier and simpler for parents and their kids. Go Mama Go Designs was started by moms armed with a mission to create a safe, cozy sleep environment for infants. You can have safety and fashion! Go Mama Go Designs co-founders, Catherine Hall and Georgia Fiebrich, have created a safe bedding alternative that is not only scientifically proven to be safe but also excluded from all bans on the sale of crib bumpers. Our mission is to educate parents about safe sleep for their children and offer a safe bedding alternative. Made to fit ANY crib, Wonder Bumpers sleek, vertical design effortlessly zip on your crib in a downward motion ensuring babies do not have access to the zipper pull. With no unsafe ties these vertical crib bumpers are super easy to use and, more importantly, easy to wash! Also included in the giveaway is the Snug & Tug Swaddle Blanket, which is a strong, stylish baby swaddler. The triangular design of the Snug & Tug is the ideal shape for swaddling and is made of high quality breathable, stretchable super soft cotton. Good swaddling blankets are made with cotton — not with fleece, terry cloth, or satin trim. Yummi Pouch reusable food pouches encourage healthy snacks for active kids. Our eco-friendly food pouches are freezer safe, dishwasher safe, BPA-free, Phthalate-free, and can be filled with healthy blended snacks and easily taken on-the-go, no spoon required! The Little Munchkin set has everything you need to get started with using Yummi Pouches! Yummi Pouches are perfect for filling with homemade baby food, blended snacks, healthy smoothies, and more! Wristy Buddy was developed from a simple question: Why do infants put their fists in their mouth? They should make something for that! From that question and that statement, Wristy Buddy was born. Wristy Buddy helps minimize wet clothes, by giving the baby something to teethe on that is easily accessible. Wristy Buddy is designed for babies who haven't developed the motor skills to hold traditional teething objects. Babies that can't grasp toys can manipulate Wristy Buddy. It is made of absorbent and non-toxic materials to help keep little faces and clothing dry. Its various textures and colors engage and stimulate. It is easily accessible to your teething baby and is more sanitary than traditional teething objects. Wristy Buddy is BPA-Free, Lead-Free, Phthalate-Free and Non-Toxic certified by a U.S. Consumer Product Safety Commission approved laboratory. Suitable for babies 3+ months. This teether is even machine washable. Enter to win all these fabulous prizes by filling out the Rafflecopter form below. Entrants must be 18+, US only. Giveaway ends July 5, 2013. Good luck! !